It is not an hour long but more like 15 to 25 minutes. Happens twice a day. Once before sunrise and after sunset. Best seen 90 degrees from the Sun’s location. Occurs no matter the weather. The last one is something I had to prove to myself. The night after I read that it was cloudy. I grabbed my camera and tripod and headed out to a nearby pond. There, as I listened to the Spring peepers, ducks and geese who live there, I started taking photos every few minutes. For the first few photos, I got the dirty gray sky I could see. The later it got the more I wondered if the blue would come. Forty-seven minutes after sunset, I took this photo clearly showing what I had read was true. Clouds, fog, rain or snow does not stop Blue Hour. Cloudy Blue Hour over a pond. Nikon D700/28-300VR, 30s, f/8, ISO 500, EV 0, 28mm focal length, tripod. Because of the trees, I was not shooting at a 90 degree angle from the Sun’s location which you can see on the far right side of the frame. This photo does show you the blue graduation from the Sun in the west torwards the east. To learn more about Blue Hour and Night Photogrpahy, see Kent Weakley’s Night Photography eClass. It was a a blast to do! Sign up today!! 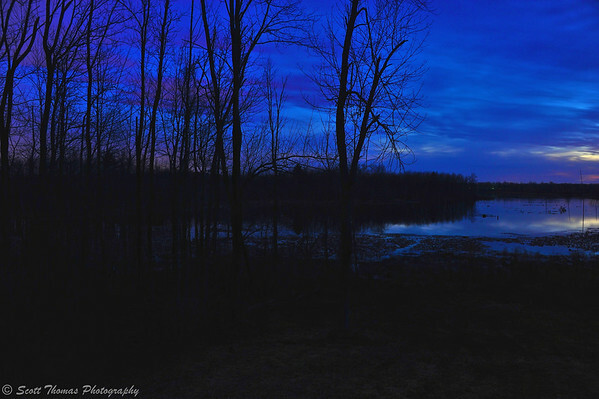 This entry was posted in Nature, Photography and tagged 28-300mm, baldwinsville, blue hour, clouds, dusk, new york, nikon D700, pond, religion, silhouette, sunset, trees, tripod, vr, water. Bookmark the permalink. Really interesting! I’m just waiting for a good chance to try that! Mountain Blue Hour…be still my heart! Go for it, Terry! Thank you for telling about this, I´m ready to try it, too. Oh, would love to be with you in Copenhagen after sunset. I bet you’ll do great at it, Truels. Nice! I like the bit of color from the sunset. I could barely see it but the long exposure could. Thanks for proving this because I really had my doubts about the blue hour in cloudy weather. I wonder if it easier to see or lasts longer in clear weather? I hear next week is supposed to be a little drier in the Pacific NW – maybe then I will check it out. What I’d give to do this on the northwestern coastline and mountains of the US! Will be looking forward to what you come up with. Beautiful capture, Scott. I love that shade of blue. I am going to have to grab my tripod and go out by the pond some evening and give this a try. After the rain stops, of course. It has not been a good Spring for night photography has it? I got rained and clouded out of my attempts this weekend. That is a really nice illustration of the point, Scott. I have a question for you. What effect, if any, do human light sources have on the phenomenon? I’m thinking about three things, really: brightly lit urban settings, rural settings with an urban glow in the distance, and then just any old yard with the porch lights on. The light will be yellow, red or green depending on the type of lights they are. Check out this post for examples: Blue in Syracuse. Scott, I bet it would be great to do time-lapse and see the transformation right before your eyes. The pond image looks amazing during blue hour. On a clear night it would last longer and be a more pleasing transformation. I’ll have to read up on how you did yours. I may put that on my To Do list for this summer. It was nice to hear the sounds of the night. There is a road close by but it is not traveled much at night. Very peaceful. All this is very interested. I have more, but this is enough.